Beats Music, the new streaming service from the popular headphone manufacturer, will open for business on January 21 in the United States, it was announced this weekend. 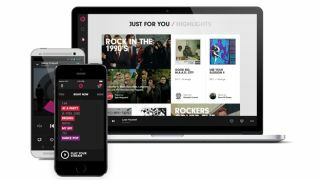 The platform, which aims to provide custom album and playlist recommendations to subscribers every day, will be available for Android, iOS and on the web immediately upon launch, with Sonos support. There'll be a free trial period for sign-ups, but after that there'll be no ad-funded free-listening option a la Spotify, but a single monthly subscription fee of $9.99 (around £6, AU$11). That'll allow users to stream on multiple devices and also save playlists for offline listening. The new service, spearheaded by Beats boss Jimmy Iovine and NIN frontman Trent Reznor, will aim to attract users with its new approach to music selection. One of the key elements is the Right Now mood music option. It will allow users to fill in the blanks of a sentence like "I'm cold and feel like cuddling with my wife to hair metal" in order to spawn an instant playlist fulfilling the criteria. Subscribers will also get a handful of 'Just For You' albums and playlists recommended to them each day, depending on their previous listening habits, the time of day and current activity. There's still no word of a launch outside of the United States at present.